​Sarah (Sally) Balfe from Kennystown, Carnew, was born in 1812. On November 3, 1831 she married Tom Balfe. They were assisted in emigrating to Canada with their four children in 1847. Tom and Sally settled in Smiths Falls in Ontario. In June 1851 they were joined here by Sally's brother, Thomas, his wife Ellen and their family. The Kenny descendants are at this stage good friends. We look forward to having them with us in August. ​It will be our privilege to have with us in August a direct descendant of Thomas. Pictured on the left is Martha Lawrence (nee Farrar), pictured with her son John on the occasion of her 100th birthday which she celebrated in 1901. When Martha, the daughter of William Farrar, was born in Coolfancy in 1801 the fear, hatred and property destruction generated by the 1798 rebellion was still fresh in the minds of all. Coollattin House together with many other farmhouses in south Wicklow, had been burned to the ground and were now under reconstruction. In 1826, a year when starvation stalked Coollattin estate, Martha married John Lawrence from Moyne. Together, on a small farm of very marginal and poor land, located in the townland of Slieveroe they reared a family of nine children. In 1848 John and Martha accepted the offer of assisted emigration. John(55), Martha(45) and their nine children, Anne(22), Thomas(20), Samuel(17), John(15), William(13), James(11), Henry(9), George(6) and Martha(5) sailed on board the 'Jessie' from New Ross on May 17th, 1848. 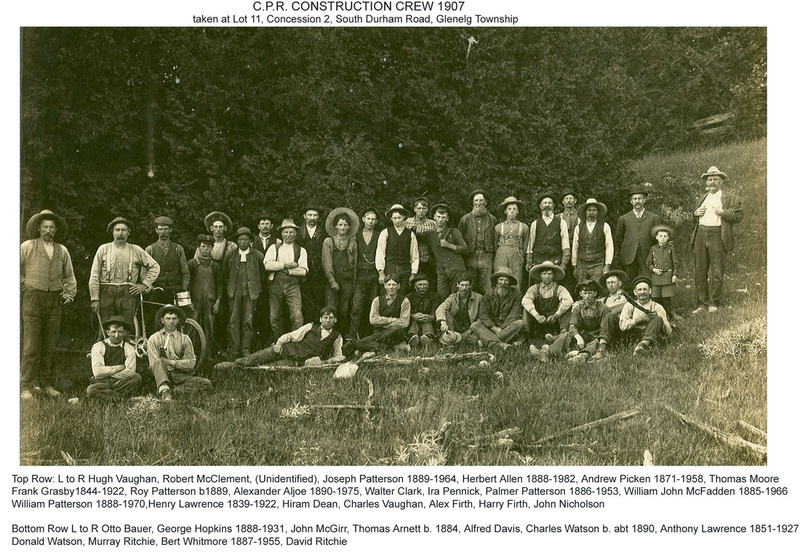 From Quebec they travelled overland to the Fergus Elora area of Ontario, before moving on a year later to finally settle in Glenelg Township, Grey County, Ontario. 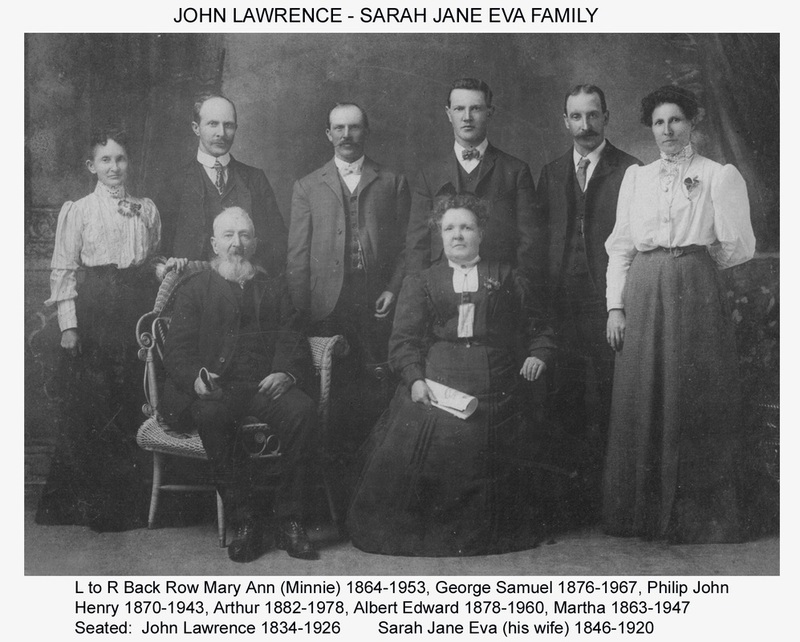 They were followed to Canada by the families of two of John's brothers, James in 1851 and Henry in 1854. 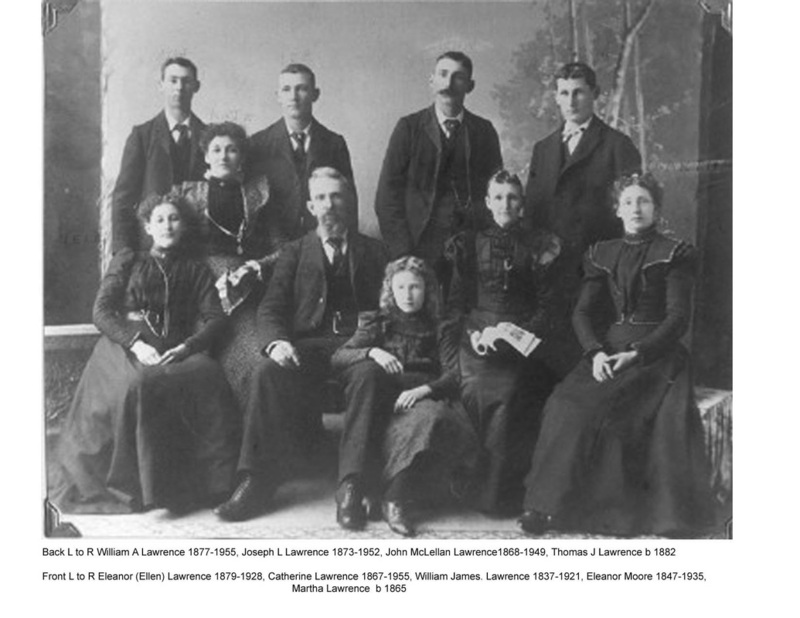 In addition four Lawrence families, who were probably related to John, were assisted in travelling to Canada from the impoverished townland of Rashenmore in the parish of Hacketstown. Martha lived through the bitterness of post '98 south Wicklow, the typhus and famine ravages of 1817, the famine and deprivation of 1826-27 on the Coollattin Estate. When Black '47 arrived she, with her husband John were struggling to rear nine children on a small farm of bad land located in the foothills of the Wicklow Mountains. Martha with her family survived the cross Atlantic journey on board the 'Jessie' in 1848. In spite of the travel, trauma and hardship that she endured within her lifetime, she was photographed at 100 years of age,.......truly a woman of great substance. It will be our honour and privilege to welcome back to the ancestral homeland, in August of this year, descendants of the family of John and Martha Lawrence of Slieveroe, in the parish of Moyne. We look forward to welcoming the descendants of the Doyle/McGrath/Fenlon kinship to our shores in August. Thomas Toole from Ballyshonog, Tinahely, was seventeen when with his mother Margaret (nee Doyle), his three brothers, Peter (14), James (8), Pat (3) and his two sisters, Mary (20) and Hannah (15), he sailed on the Jessie on 17 May, 1848. Thomas' father, Pat, was listed to travel in the Emigration Books in March 1848. According to family tradition, Pat was killed by a falling tree before the family left Ballyshonog in May 1848. James Kavanagh from Parkmore, Carnew was thirteen when, in 1852, he left for Canada with his parents, brother and three sisters.They travelled by train to Toronto. From there they set out for Barrie. With the exception of a three mile lift from a man with a horse and buggy along the way, the family travelled on foot for the last sixty miles. If any descendant of this man or his extended family see this we would be delighted if you could get in touch with us. Thomas Griffin and Jane Saunders were married on 11 August, 1844. They lived in the townland of Knocknaboley. As early as 1778 Thomas' grandfather held a lease with Thomas Kemmitt on this townland.. Sailing on board the Glenlyon they left New Ross en route to Quebec on 15 April, 1851. They had with them their three small children. 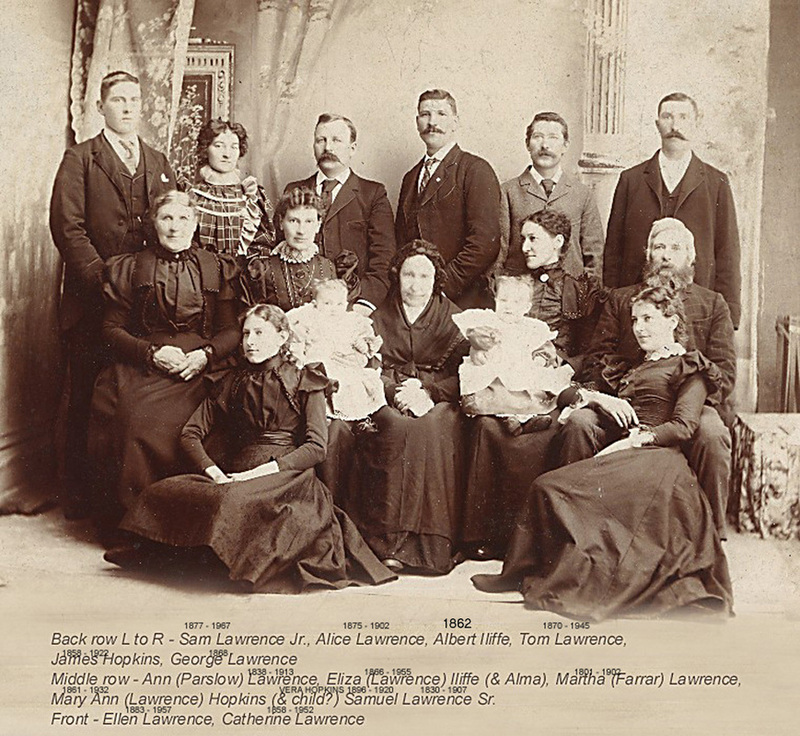 The family settled in Cartwright Township, Durham County, Ontario. Fellow colonists here were James Saunders and William Darcy who were also from Knocknaboley. The family moved to Howick, Huron County about 1860. They died here sometime after 1886. The photograph featured here was taken in 1883, a few years before their deaths. ​It will be a privilege to walk through Knocknaboley with Tom McCabe, the great great grandson of Thomas Griffin.